A dry cough can be quite infuriating, especially when it interferes with work or sleep. The worst part is that it may seem to occur without a cause and can be quite persistent. If you are one of the many people tormented by a dry cough, we have some simple remedies that will combat this problem efficiently. However, it is important to offer you a complete picture of this condition first. How is a dry cough distinguished from other types of cough? Asthma: A dry cough is the main symptom of a type of asthma called cough variant asthma. In this case, the dry cough is accompanied by shortness of breath, wheezing, and chest tightness. Gastrointestinal problems: Acid reflux may irritate your esophagus, resulting in coughing, throat irritation, and heartburn. Digestive problems also accompany it. If you suffer from this problem, you should have an alkaline diet including fresh fruits and vegetables. Hot and spicy food should be avoided. Postnasal drip: This refers to a condition in which excess nasal mucus seeps back into your throat commonly occurring during a common cold. Soreness, itchy throat and mild fever may also occur along with a dry cough. 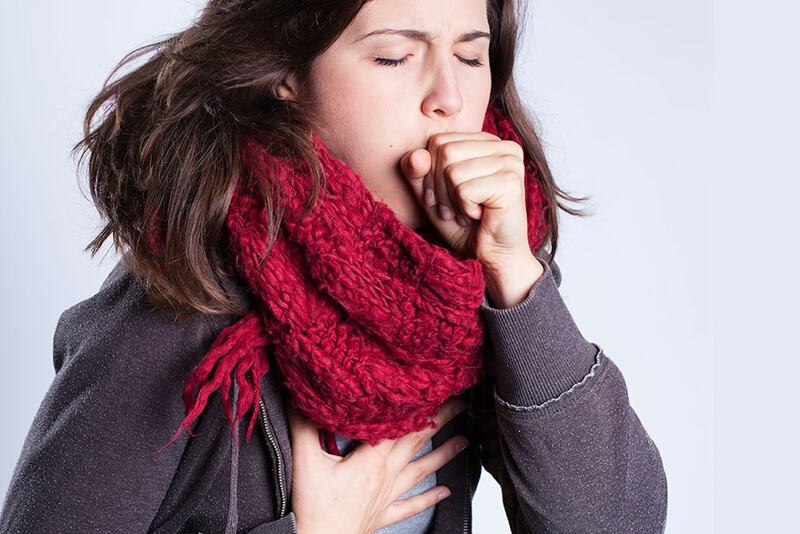 Environmental pollution: Air pollution is often a trigger for a dry cough. You may develop an allergy to substances present in the environment such as animal dander, mold, or pollen. In this case, it is essential for you to identify this substance and take necessary precautions when exposed to the allergen. Dryness in the air can also lead to coughing. Hence, purchasing a humidifier can be helpful too. Smoking: Smoking can irritate the air passage and the deposition of particles, both of which trigger a dry cough. If you are a smoker and have a persistent dry cough, throat pain, and unexplained weight loss, it is advisable to visit your doctor. Lung collapse: In some serious cases, dry cough or coughing bouts may be the result of lung collapse. Your chances of getting this increases if you already have a pre-existing lung disease. Stress response: Your dry cough can also be psychosomatic; it can be your body’s way of responding to stress or anxiety. If you notice that your cough worsens during stressful conditions, you may want to consult a psychologist. Sarcoidosis: This is a condition in which the body’s immune system becomes overactive and starts attacking the body, including the lungs, resulting in damage, which triggers a coughing reflex. A sore throat or itchiness in the throat, which may also be accompanied by pain and a stinging feeling in the throat. Croup cough: A croup cough, or a barking cough as it is commonly known, often occurs in children. It is caused by swelling in the trachea, and its most distinguishing feature is the loud bark-like sound. Whooping cough: An easy way to differentiate between dry cough and whooping cough is that whooping cough progressively deteriorates, and you may experience several bouts of coughing, lasting for a few minutes. This is especially noticeable at night. Pneumonia: This starts with a dry cough, but gradually mucus appears which is usually yellow or green. It may be accompanied by fever and chills, which are not experienced with a simple dry cough. There is blood in your cough. This can be because of a mild trauma in your esophagus or due to some sort of obstruction. Either way, it is advisable to consult your physician. 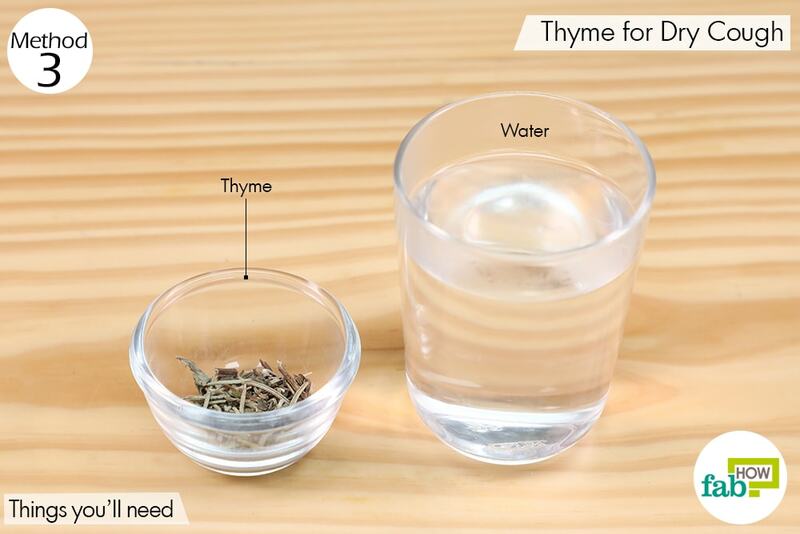 Fever or chills accompany your dry cough. This may be a reliable indicator of an infection. You experience sudden or unexplained weight loss. Your cough increases during the night. This may interfere greatly with your sleep. If a dry cough is accompanied by chest pains or shortness of breath, it may happen if you are suffering from asthma or wheezing. You feel like you are choking on something or feel a lump while swallowing. This may or may not be accompanied by pain. A sore throat is accompanied by pain in the ears. A cough is accompanied by a rash or any other form of allergy. Caution: Consult your healthcare provider if a cough persists more than a week. Do not use the medication prescribed for adults to treat children below the age of 8 which may cause complications in children. They need to be seen by a healthcare professional for proper diagnosis. There is a possibility that after consuming these medications, you feel sleepy or sluggish. It is therefore not advisable to operate heavy machinery or drive after consuming these medicines. 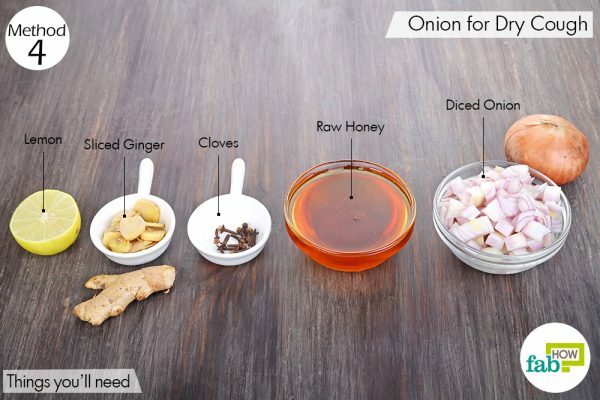 Keeping in mind the frequency of a dry cough, it is a relief that there are a number of home remedies that you can use to cure it. These are made from simple materials and help you to avoid the side effects of medicines. 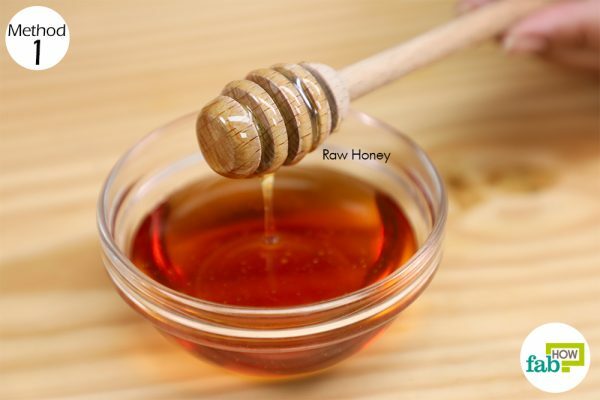 Consume 2 teaspoons of honey twice a day. Alternatively, you can add 2 teaspoons of honey to warm water or herbal tea and sip on it. 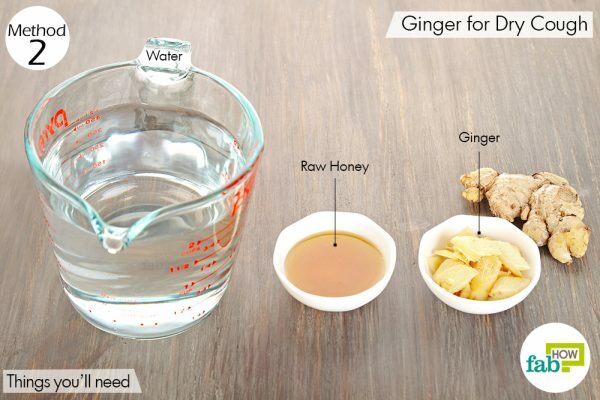 Ginger, like honey, is hailed for its analgesic and anti-inflammatory properties. Ginger eases your dry and itchy throat and reduces inflammation and pain. 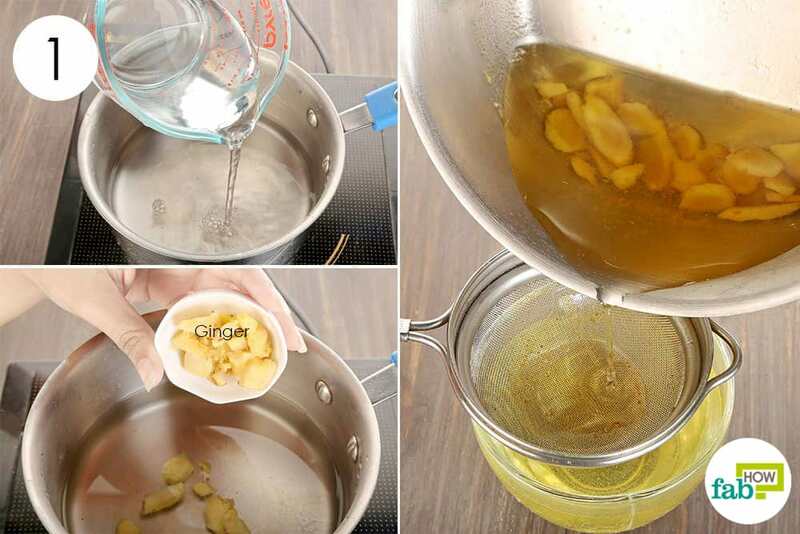 (6) Mixing honey with it would make the concoction more potent and would also counter the taste of ginger, which might be unpleasant for some. Pour water in a saucepan and add ginger to it. Bring it to a boil and simmer for a few minutes. Turn the heat off and strain the tea. Add honey to the tea and drink it while it is warm. Sip on this tea twice a day. Put crushed thyme leaves into a glass of boiling water. 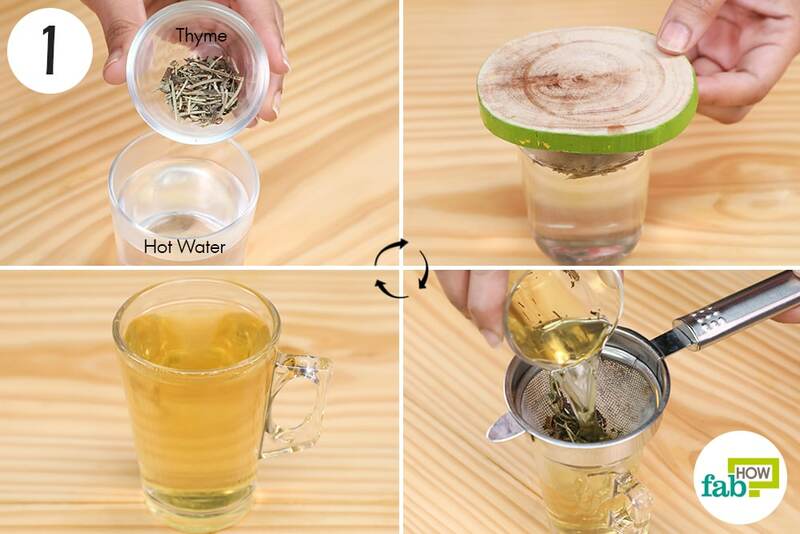 Strain the water into a cup and drink it. Caution: Do not refrigerate the water for later use. The water should be consumed when it is at room temperature or slightly warm. 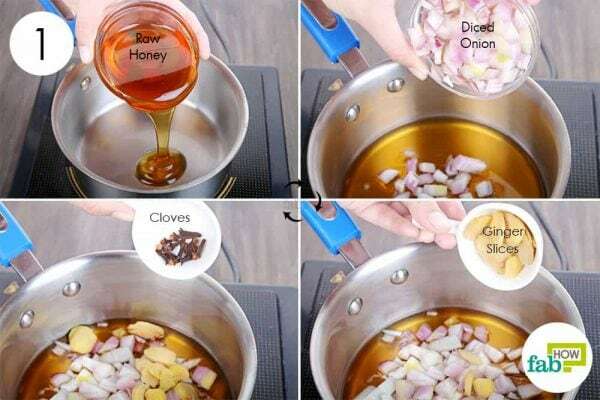 Pour the honey into a saucepan over low heat. Add the diced onion to it. Put the ginger and the cloves into the mixture. 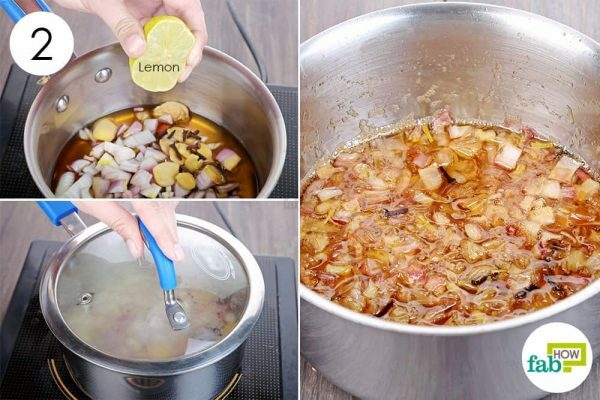 Squeeze half a lemon into the onion-honey-clove mixture. Cover the saucepan and let it simmer on low flame, for around 20 minutes. After that, remove the heat source, and allow the mixture to cool down. 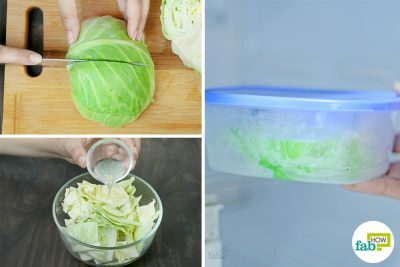 Strain the mixture into a container and allow it to cool down. 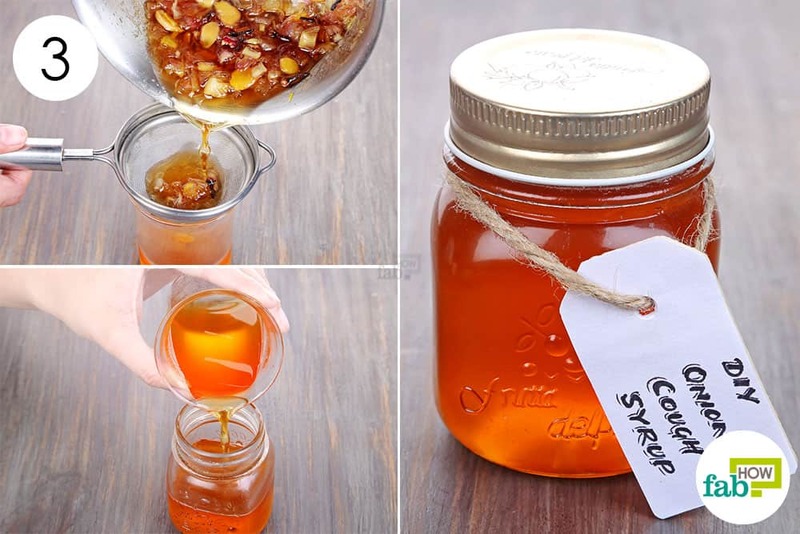 Once it has reached room temperature, transfer the syrup to an airtight jar. 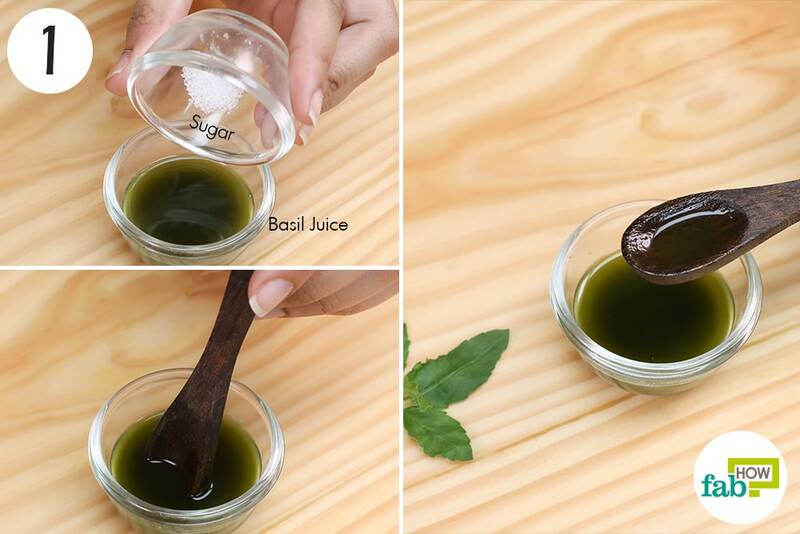 Consume 1 teaspoon every 2 to 3 hours to reduce coughing. You can store this syrup in the refrigerator for about one month. 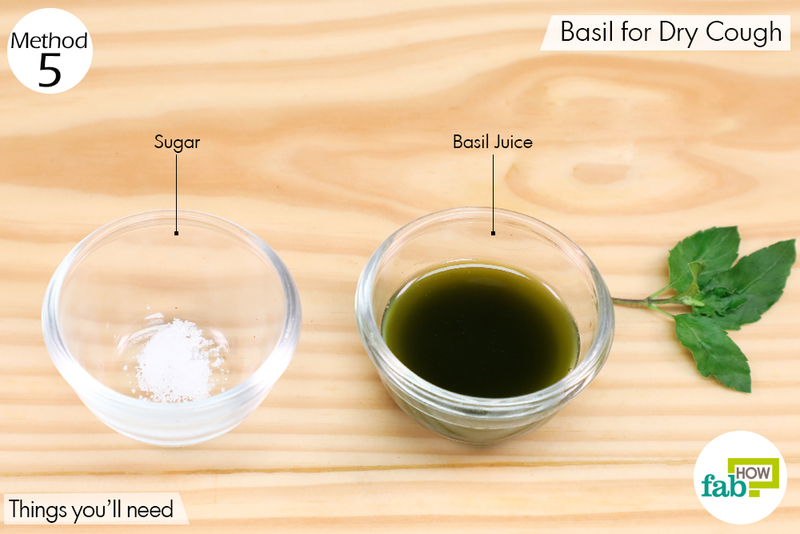 Add the sugar to the basil juice. 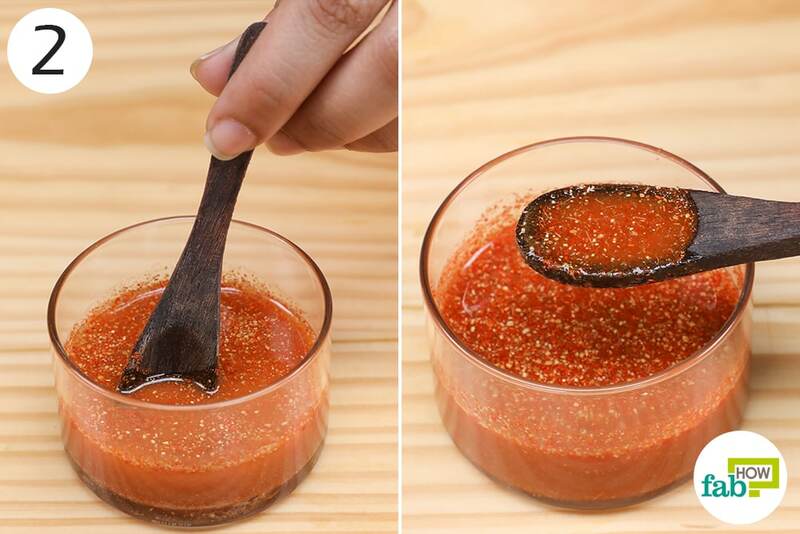 Mix the two well, using a wooden spoon. 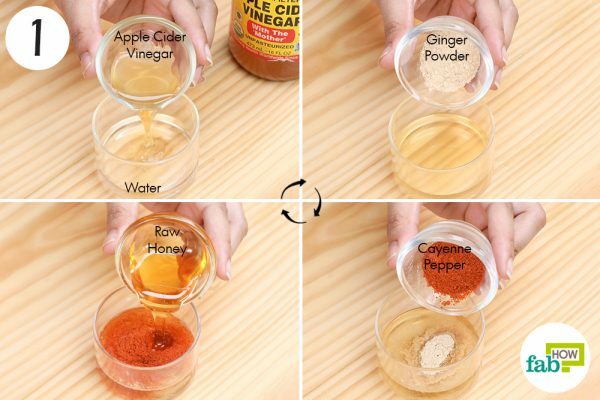 Pour the apple cider vinegar in a container with water. Stir the ingredients using a wooden spoon. Once mixed properly, consume the mixture periodically. 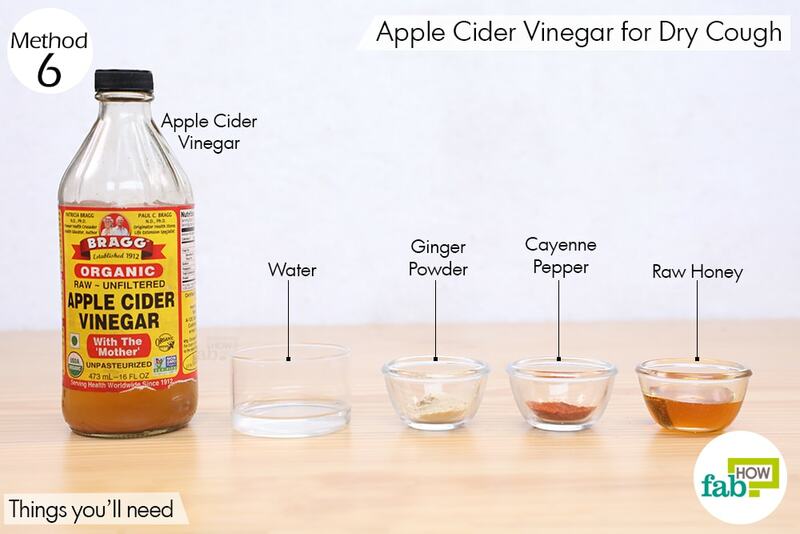 Caution: Use apple cider vinegar in moderate quantity as it may cause acid reflux and throat irritation. Stay hydrated by increasing your water and other fluid intakes. The water that you consume should be at room temperature or slightly warm. Having very cold water may increase a cough. Purchase an air purifier or a humidifier to help get rid of a dry cough. Do not smoke or inhale a lot of smoke. If you are already in the habit, make efforts to quit smoking completely or at least cut back on how often. Do not have very spicy food, as that may cause acid reflux. Michaudet C, Malaty J. Chronic Cough: Evaluation and Management. AAFP Home. https://www.aafp.org/afp/2017/1101/p575.html. Published November 1, 2017. Kardos P. Management of a cough in adults. Breathe. https://breathe.ersjournals.com/content/7/2/122. Published December 1, 2010. Goldman RD. 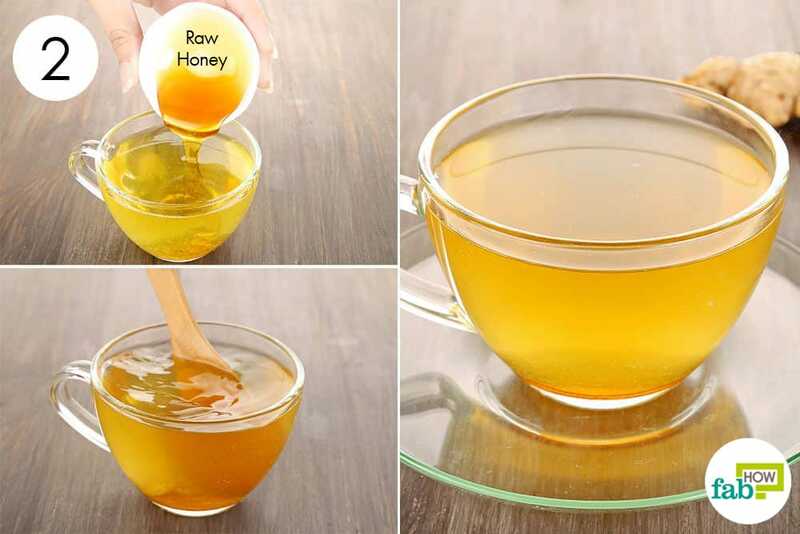 Honey for treatment of a cough in children. American Family Physician. https://www.ncbi.nlm.nih.gov/pmc/articles/PMC4264806/. Published December 2014. Bode AM, Dong Z. The Amazing and Mighty Ginger. Taylor & Francis. https://www.ncbi.nlm.nih.gov/books/NBK92775/. Published 2011. Wagner L, Cramer H, Klose P, et al. Herbal Medicine for Cough: a Systematic Review and Meta-Analysis. Complementary Medicine Research. https://www.karger.com/article/fulltext/442111. Published December 14, 2015. Michigan Medicine. https://www.uofmhealth.org/health-library/hn-2174009. Published May 24, 2015. Michigan Medicine. https://www.uofmhealth.org/health-library/hn-3657001. Published May 6, 2015. Cohen MM. Tulsi - Ocimum sanctum: A herb for all reasons. Journal of Ayurveda and Integrative Medicine. https://www.ncbi.nlm.nih.gov/pmc/articles/PMC4296439/. Published 2014. Johnston CS, Gaas CA. Vinegar: Medicinal Uses and Antiglycemic Effect. Medscape General Medicine. https://www.ncbi.nlm.nih.gov/pmc/articles/PMC1785201/. Published May 30, 2006. Millen BKM. Home Remedy for a Cough. The University of Pittsburgh. https://www.pitt.edu/~cjm6/sp99cough.html. Published 1999.